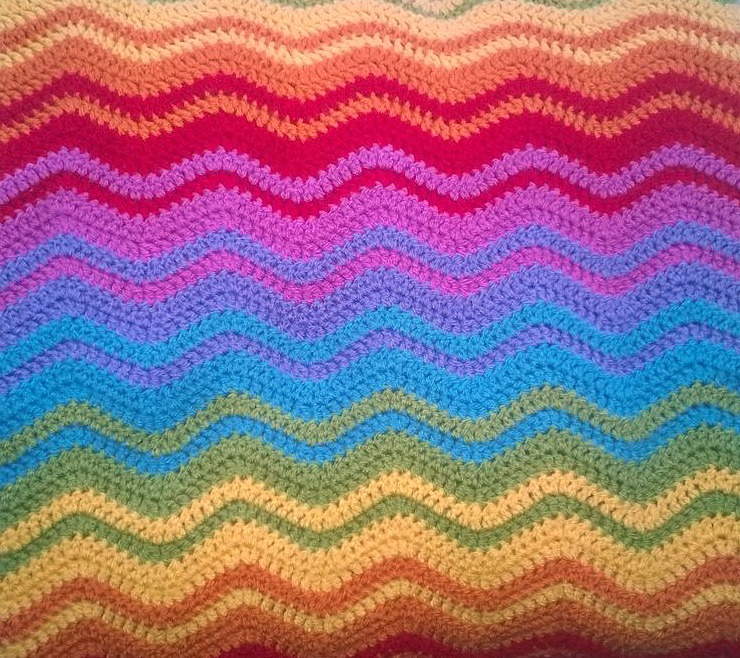 I fell in love with making blankets after making the Attic24's granny stripe a few years ago. I decided we needed another one, and a big one to boot! I wanted something we could all snuggle up on the sofa together through the cold winters. It had to be big, it had to be soft and it HAD to be COLOURFUL!!!! I wanted a rainbow... but it took me a long time to work out exactly which colours would be perfect. These are all Stylecraft Special DK and colours left to right are Magenta, Bluebell, Turquoise, Meadow, Spice, Saffron and Lipstick. I bought two of each and sat down ready to start the loooooonnnnnnggggg starting chain! I wanted to do another Neat Ripple by Attic 24 but I wanted to do something a little different. I has seen some blankets with a gradual colour change on stripes, where the colours interlock. So I wanted it to be the length of our 3 seater sofa, which would be 21 waves, so a massive 297 starting chain! Each 28 row is around 30cm and I did 5 repeats measuring a total of 150cm. 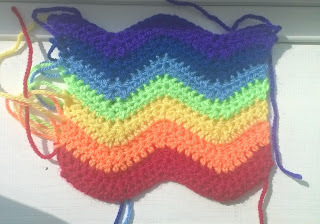 I just did a simple filling in the ripples in Magenta, then a simple single row of DC border in Bluebell. I felt that the blanket was bright and busy enough no to need much of a fancy border. 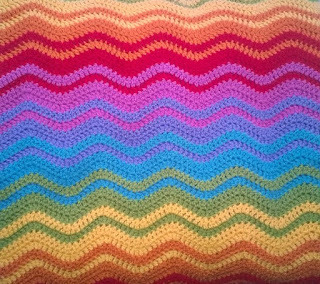 I oh I do LOVE this blanket, its used by the children in the day for naps, forts and general playing, and evening what's better than to snuggle up under a rainbow blanket to watch a bit of TV. 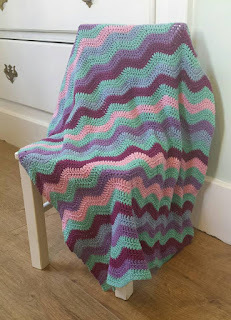 In total the blanket measures 190cm wide by 150cm long, it took around 14 balls of Stylecraft Special DK and unknown hours of loving crochet, but I couldn't be happier! A friend of mine spotted some crochet baubles and fell in love a couple of weeks ago, and asked if I could make some for her. So after a bit of googling for some patterns I came across this one. It looked pretty simple, so I bought a load of polystyrene balls to go inside from Little Crafty Bug and thought I would give it a go! I bought the polystyrene balls as we both have very lively small children and didn't think glass baubles are a good idea for us! 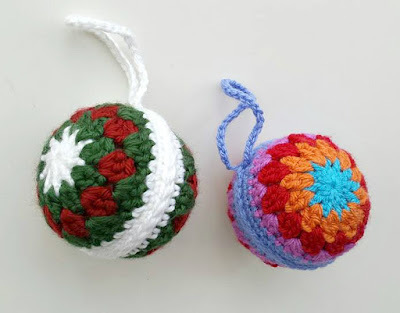 The one on the left is made using Caron Simply Soft Yarn which is available at Woolwarehouse for £3.99 a 170g ball. It is an aran weight in 100% acrylic, but it is the softest acrylic I have used. The colours are Dark Sage, Autumn Red and White. It has a silky sheen to it and is beautiful to work with. Its the first time I have used this yarn, but I will definitely be using it again. I am also making some Christmas Stockings with it for my girls which I will post about later once I have finished them. The one on the right is made using Stylecraft Special dk, in colours Turquoise, Spice, Lipstick, Magenta and Lavender. Stylecraft Special dk is my usual go to yarn for pretty much everything. 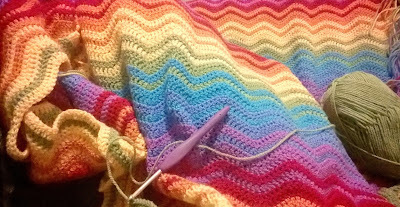 I was introduced to it though Attic24 granny stripe pack, which was one of my first blankets, and I have been using it ever since. It is high quality but relatively inexpensive to buy. There are quite often offers on it at Deramores or Country Crafts, however if I am doing a order for a customer and need it quickly you cannot beat Woolwarehouse for speed of delivery. I have once had an order arrive the following day (within 24 hours!). A note when buying Stylecraft Special the stock images for the colours are pretty rubbish and quite often look nothing like the actual colour I have found! What I normally do if I am choosing a colour that I have not used before is to check on Ravely of pictures of people projects to get a better indication of what the colours look like. So back to the baubles.... 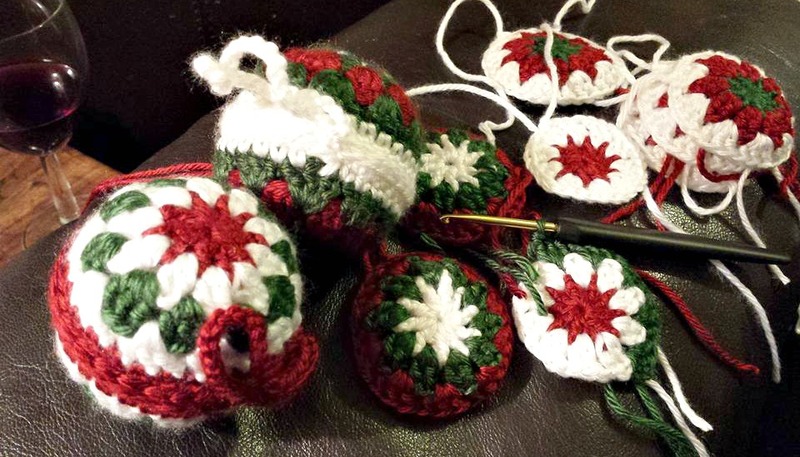 I had to play around with the pattern to make the covers fit the baubles tightly. I used a 3.5mm hook for all of it as I wanted the stitches to be tight, and the holes smaller so you cant see the polystyrene ball underneath. As I used a smaller hook had to add another row 3tr clusters. With the Caron, which is a heavier weight yarn, I dropped down to 10 stitches on the first ring, but kept with the 3.5mm. Thanks for reading and I hope you all have a great day and Christmas! Hello, this is my first post and I just want to introduce myself. I am Lyndsey, mother, crocheter and lover of all things bright and beautiful. 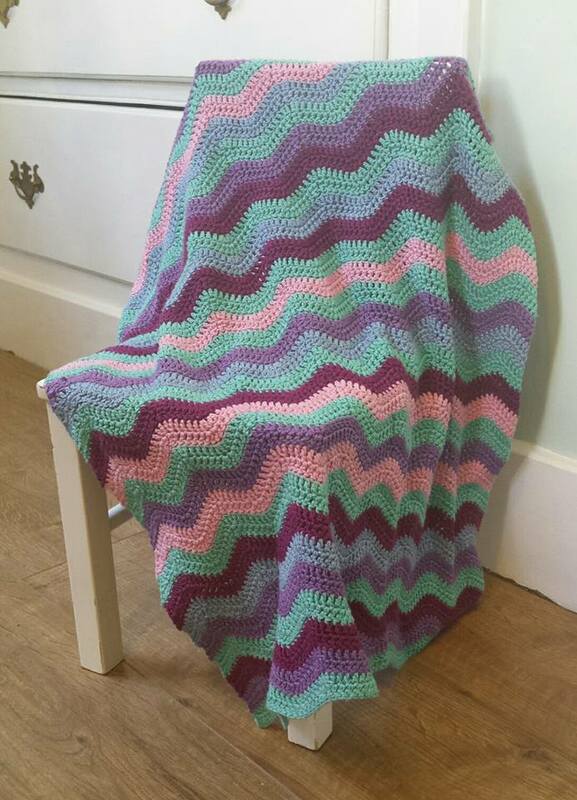 I learnt to crochet and knit as a child, but I picked back up the hook when I was pregnant with my second child. 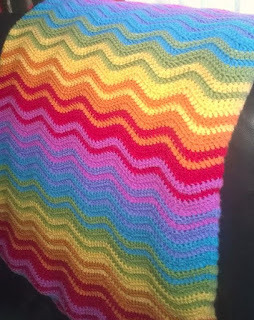 I had only intended on making a baby blanket, but instead turned into a hobby, then obsession and now occupation. 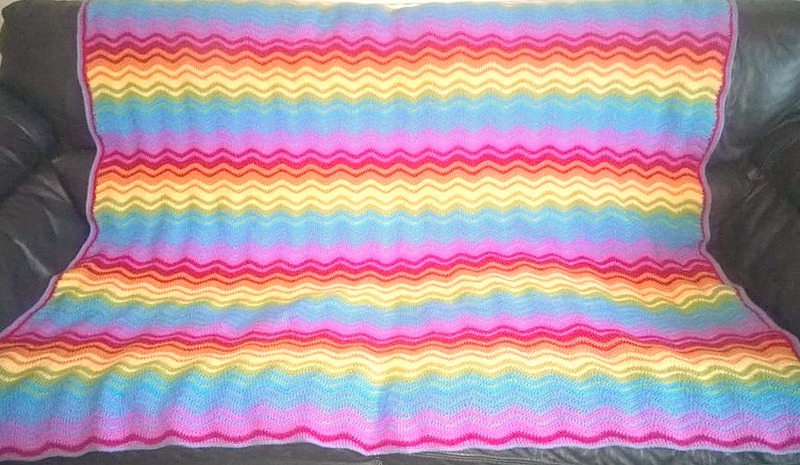 Here is my first attempt at making a baby blanket. 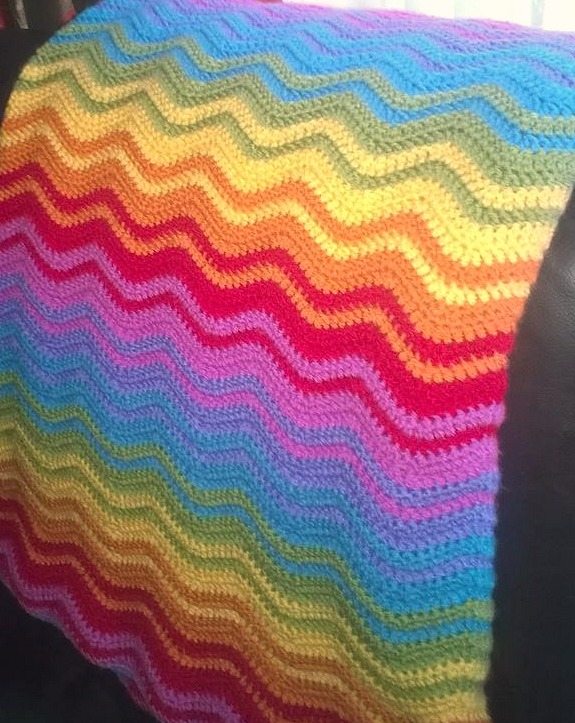 It was made using Paton 100% Cotton yarn using Attic24s neat ripple pattern and it is beautiful! I immediately got the crochet bug! 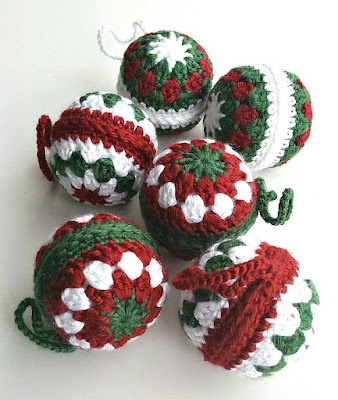 I am going to use this blog to share my love of crochet and hopefully inspire and help others along the way. Hi, I'm Lyndsey and welcome to my blog. I am a mother, crocheter and a lover of all things bright and beautiful. I have been crocheting and knitting since I was a child and have created this blog to share my love of all things yarn.